(NaturalNews) Commodity crops like GMO corn and soybeans dominate most of the agriculture production in America today. For instance, when one travels during the summer months through a state like Illinois, they begin to realize that biodiversity of crop production is practically dead. After looking down row upon row and field upon field of corn and soybeans, it's easy to see that corporate and special interests now dictate the agricultural sector. Nearly 80 percent of Illinois land area is farmland. The state's basic commodities generate roughly $9 billion annually, with corn accounting for nearly 40 percent of that total. About 33 percent of that production is attributed to soybeans. Another 23 percent goes to swine, dairy, and poultry. This means that all the nutritious fruit and vegetable crops make up only 4 percent of the agricultural economy in Illinois. Sadly, the world cannot be sustained by just corn and soybeans alone. Where are the abounding fields of broccoli, celery, collard greens, kale and spinach? Why are apple, strawberry, blueberry and peach farms so rare? It's the vitamins and minerals in fruits and vegetables like these that power the body, bringing quality of life and longevity. A new study from Emory's Rollins School of Public Health (RSPH) suggests that monoculture is restricting people around the world from living a quality life. The researchers showed that, by increasing global nutritious fruit and vegetable production by 22 percent, 1.7 million lives could be saved each year. This figure smacks the US medical system right in the face. Could saving millions of lives really be in the hands of the foods that we choose to eat? More importantly, how is humanity being systematically weakened and destroyed by the corporate interests that govern agriculture today? People aren't dying around the world due to lack of medications. 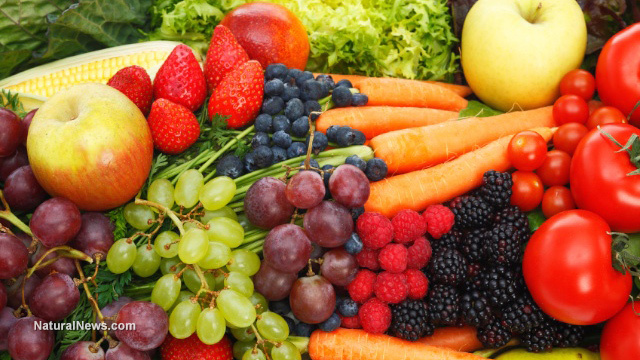 According to the report, 1.7 million people are dying due to a lack of fruit and vegetable intake. Global dietary guidelines recommend that people consume at least five servings of fruits and vegetables daily. The researchers were curious: Is there even enough fruit and vegetable production currently to cover the needs of the world population? "There is a strong relationship between higher fruit and vegetable consumption and lower mortality," said Karen Siegel, MPH, of the Hubert Department of Global Health at RSPH. "This relationship extends to major chronic diseases such as cardiovascular disease, diabetes and certain cancers. Although much of the world's population does not consume the recommended servings, if health professionals are to encourage these recommendations, we must also consider the shortage of supply." Pooling together population and agriculture databases from around the world, the researchers began comparing the supply of the health foods with the demand for them (based on dietary intake). They studied the year 2012 and made projections for global supply and demand for 2025 and 2050. What the researchers found for 2012 was a global supply of fruits and vegetables that falls 22 percent short of meeting population needs. For lower income countries, the deficit of health foods was much greater -- a stunning shortage of 95 percent. If agriculture systems stay on the same trajectory that they are on now, then by 2025 the researchers predict a fruit and vegetable supply deficit of 34 percent. By 2050, there could be a shortage of 43 percent across the board. These figures do not account for the collapsing butterfly and honeybee populations which are crucial for pollinating many key fruit and vegetable crops. "Our research is significant because it shows that these gaps may only worsen with time, particularly for low-income countries," said K.M. Venkat Narayan, MD, the Ruth and O.C. Hubert Chair of Global Health at RSPH. "This information sets the stage for further analyses and a deeper look into policy levels for increasing production and supply. Change is possible." For a state like Illinois, change is possible if fruit and vegetable production is allowed more equally into the picture. If corn production dropped from 40 to 30 percent and soybeans from 33 to 21 percent, then fruit and vegetable production could grow by 20 percent, providing the nutrition that people need to survive and thrive, effectively closing the 22 percent deficit of nutritious fruit and vegetable production observed in this study.